Prakash Jha’s multistarrer Rajneeti released to packed houses last weekend. It boasted the starcase of Nana Patekar, Naseeurrudin Shah, Arjun Rampal, Ajay Devgn, Manoj Bajpayee, Ranbeer Kapoor and Katrina Kaif amongst others. The story is inspired from the greatest epic Mahabharata and set in todays’ times amongst the dirty world of state politics. I found the film very interesting to begin with. The first half is very riveting and keep you hooked when every character is introduced. Of course you have the Mahabharata story at the back of your mind so you kind of know how each character is going to turn out to be. Although there are quite a few surprises as well. The movie gets more and more interesting as it progresses however in the last 30 minutes it becomes highly predictable and bit weak. The 3 hour length is not at all a problem as it keeps viewers engrossed throughout even though there are no songs to break the monotony of serious scenes. The film depicts the behind the scenes working of a party and politics within the party and a family. It reflects todays’ times and happenings very aptly. The election rallies, the slogan chanting, the crowd scenes look quite genuine and gives you a real feel of what elections are like in India, especially in rural and semi-urban India. I do have some issues and questions with the film like what happened to Naseerudding Shah’s left- wing character, surely making 1 woman pregnant did not force him to leave his politics and life. I was hoping for that character to be back at some stage in the film. Also Katrina Kaif is truly expressionless and one things is sure that she was not selected for the role for her acting skills or her Hindi speaking skills. Her character was not even foreign-returned or of a foreginer then why the silly accent? Why couldn’t the director chose anyone else? Maybe because she looks beautiful when she doesn’t speak and is a salable name at the box office !! Also the film has no real central character with whom you identify. All the characters have grey shades, which is good to see but you need to have one central figure with whom you want audience to empathize, here that was missing. One big logical error which has mostly gone unnoticed is that the initial rally is shown to be taking place in the year 1983. Assuming that Ajay Devgan was concevied the very same night, he couldnt havt been born before 1984 and that would make him about 25 years old in 2009 and since he was the eldest amongst all, the other characters like Arjun Rampal, Ranbeer Kapoor, Manoj Bajpayee and Katrina Kaif all have to be under 25 and as far as my Civics knowledge goes one has to be 25 years to fight an election in India !!! Did the story writer and the director miss this point ??? Acting of the leading characters is top-notch and Nana Patekar as Brij Gopal of course has the best character although I think that character is bit restrained and needed to have lot more witty dialogues. Ajay Devgn suits perfectly well in the role of Suraj/ Karna but again his character needed lot more depth. He looked confused in quite a many scenes. Arjun Rampal is perfectly cast as Bhim/Yudhistir combo and looks good and surprises us by acting decent enough as well. Ranbeer Kapoor’s ‘Arjun’ shoulders the film completely in 2nd half and his character is lot more like Abhishek Bachchan’s character in first Sarkar movie. Although it goes without saying that both Sarkar and this movie are inspired from Godfather. Manoj Bajpayee acts very well and his mannerisms perfectly suit his character. Finally he has a got a role worth his talent. Shruti Seth in a tiny role was a surprise too and she looks good enough for slightly lengthier roles in future. Even Sarah Thompson acted quite well and much better than plasticky Katrina Kaif, who I think should have been replaced by an actress with better acting skills. Also the lady playing ‘Kunti’s role was not so effective. Technically, I wouldnt comment much but editing seems to be sharp and kept the viewers hooked for the entire duration of 3 hours. I missed some of the songs especially Aadesh Srivastava number ‘Mora Piya Mosse..”, but the film didnt require any songs and am glad that the director stuck to his conviction. The film had quite a few crowd scenes and it must have been some effort to pull them off convincingly. The film could have been much much better but I guess in today’s times of Houseful and Kites this film comes as a welcome relief to all cinegoers. The Box office performance of the initial weekend suggests that the film is bound to recover all its cost and make some good money for its makers. This is definitely a good news and films with better content need to do well on box office so as to inspire other makers to make films with even better content. Its not the stars and the marketing gimmicks that make a film work but a well written story and novel concept in story telling that does. IPL is over, well almost. The Films are back. Since last 6 weeks or so thanks to the IPL, barring few low budget movies, art-house cinema stuff, made-for-multiplex movies and Prince ( don’t know which category that film can be in….maybe absurd) no major films released. From Next Friday this drought would be hopefully over starting with Housefull starring Akshay Kumar and gang ,directed by Sajid Khan, the film will open to full houses thanks to the songs, the stars, big budget setup, funny promos and a recent drought of quality film entertainment. Will it live up to the hype is another story. Next up is Yash Raj venture Badmaash Company starring Shahid Kapur, Anushka Sharma and directed by Parmeet Sethi this film is targeted towards youth with its young starcast, foregin locations, casinos and theft theme. The film has a young and fresh look and an average music but would certainly appeal all fans of such movies. Kites will be the biggest release of the month starring Hrithik Roshan, Barbara Mori and the rest. Hrithik Roshan has a great box-office pull and his last major release Jodhaa Akbar was couple of years ago ( if you do not count Luck by Chance – where he was more a supporting role) . This film with supposedly hot scenes of the leading pair, fantastic action and romance appeals to young and old. The film has an international song less version as well and would certainly open the biggest this year, at least so far. Rajneeti is the first major release which comes 2 weeks after Kites and promises to be an interesting political thriller loosley based on the mega-epic Mahabharata and featuring hottest actors like Ajay Devgan, Nana Patekar, Manoj Bajpayee, Naseeruddin Shah, Arjun Rampal , Katrina Kaif and this generation’s hottest young actor Ranbeer Kapoor in possibly a role with grey shades. This film based on Indian politics in the Hindi belt and directed by Prakash Jha is sure to attract both masses and classes to the cinema. People are loving the promos and cannot wait for it to release. 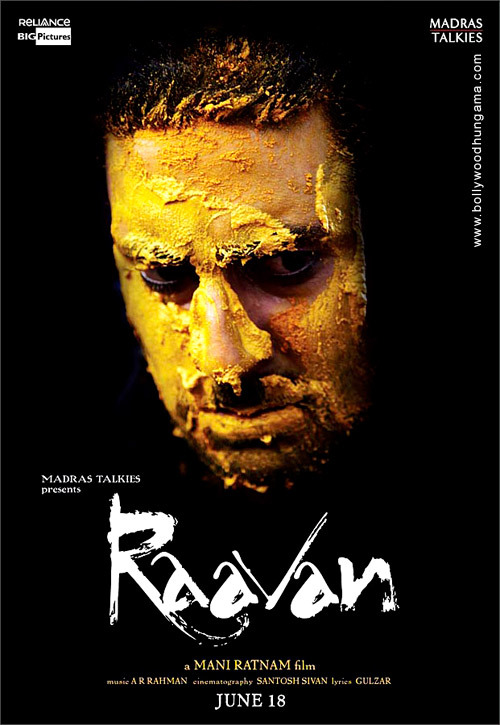 Mani Ratnam’s bilingual Raavan starring Abhishek Bachchan, Aishwarya Rai Bachchan, Vikram, Govinda and ensemble cast is the next one, releasing on 18th June. This film based on another mega-epic Ramayana is shot simultaneously in both Hindi and Tamil, has music by A R Rehman and is a modern day adaptation of the epic from the point of view of Raavan. The film shot in jungle of Kerala and Madhya Pradesh would surely be the one to watch out for simple because of Mani Ratnam’s magical touch. Thus the next 2 months promises to deliver great new exciting films to the lovers of Hindi Cinema and hopefully the box office will not remain barren for long time. May the best film win.